My workout routine has become fairly consistent at this point, mostly running with a couple of weekly cross training sessions. The amount of effort I put into running varies based upon circumstances. During the week my runs are fairly short owing to an extremely tight morning schedule. On the weekends I try for distance, usually doubling (or more) the average weekday distance that I had been running. This has worked for me and although it is one of my 2009 fitness goals, I haven't taken any full rest days this year. On the other two days I focus on cross training, mostly on the elliptical machine. I have had some trouble with this unit but overall I really like it. 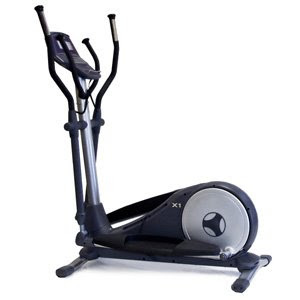 It's solidly built, easy to operate and has a small enough footprint to fit in my guestroom along with the treadmill. Although the elliptical provides an excellent workout and can be adjusted to require a formidable amount of effort to use, I always view my cross training days to be a welcome break from the rigors of running. The elliptical exercises some different muscles than we use for running and I think this helps overall. The device also provides some upper body exercise but the impact of that is not really apparent until the resistance is ratcheted up to its higher limits. All the same I think it's contributing to my better upper body definition. The great thing about elliptical days, for me, is that I feel like I'm getting away with less work while I know that most of the time (based upon HRM readings) I'm doing the same amount of work as I do when I run. Another key benefit to the elliptical is the lack of impact on your knees when you use it so it's a great alternative when you are dealing with a muscle pull or have knee twinges. If I had to choose one I would pick running over the elliptical every time and I think the reasons are obvious. But on certain days, especially following a couple of days of hard long runs, that elliptical is a welcome alternative.